I am originally from Southern California. For the past seven years I have lived near San Luis Obispo, which is located on California’s Central Coast. Currently it is painting miniatures full time. Before that I did civil engineering, but during the economy down turn I was laid off. I have been playing table top games since about 7th grade. It all started when my science teacher brought Star Fleet Battles into class for us to play at recess/lunch. He also owned a game store. So one weekend I went in and they were playing Warhammer 40k (2nd ed.) and I was totally hooked. 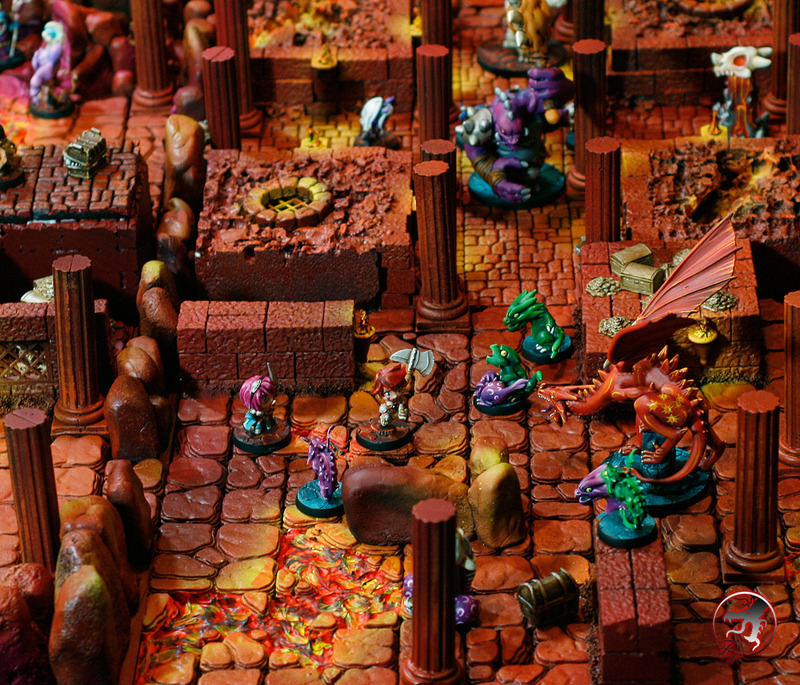 What tabletop games do you play? What armies do you play in those games? What drew you to Super Dungeon Explore initially? I was drawn to the artwork and the retro gaming feel that it had. I am always on the lookout for games that my wife and I can play together and when we have friends over. I cannot talk her into the larger miniatures games, Warmachine/40k, so this seemed like a perfect game that still had miniatures. 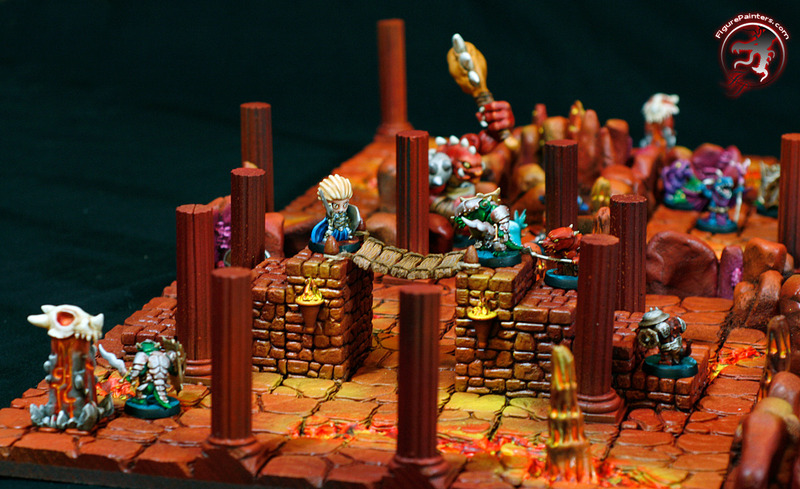 Did I mention I LOVE miniatures?…. 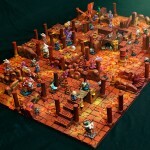 How long did it take you to build the Super Dungeon Explore boards? I took about a month. I would cast up the parts during the day as I was painting and then assemble what was dry at night while watching TV. They probably could have gone together faster if I worked on them solidly. There were some weeks when I barely touched them. 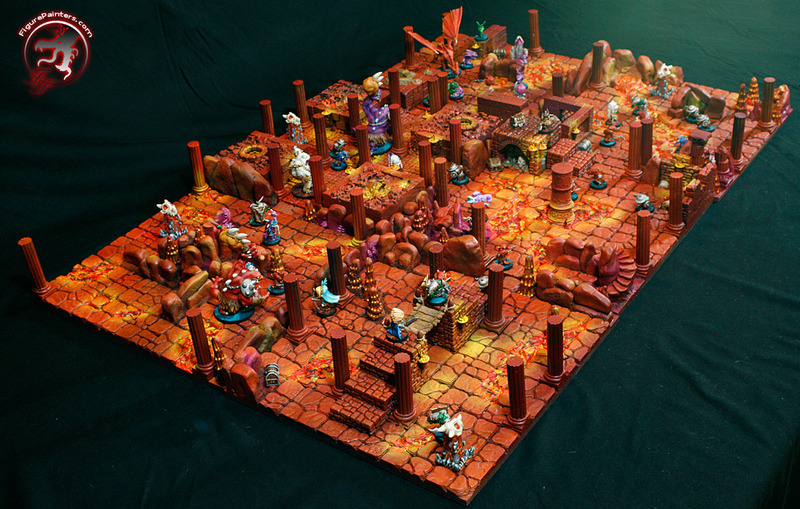 What materials did you use to build these boards? I used Silicon rubber molds and Hydrostone to cast up the individual pieces and then attached them to a piece of 12″x12″x1/4″ piece of particle board. After everything was glued down using thick tacky craft glue, I primed them and used spray paint for the base colors. I used 4 different colors of red, from deep crimson to an almost orange. Large spray paint cans make it pretty easy to quickly paint your base colors while providing a durable finish. After that I clear coated them as they were a little shiny and I was worried that the acrylics that I was going to use to detail it out with would not stick well. After that it was out with the airbrush and craft paints to add all the lighting and detailing. I plan on having a step by step put together so you can just check my site in a week or so and it should be up. Any plans to build more boards with different layouts/themes? Why yes I do! I am working on a purple themed board with ornate floor tiles. I am also working on making some custom boards that people would be able to buy for those that don’t have the time to make their own. How does the 3D aspect of the boards affect the gameplay? How have you handled things such as climbing up and crossing bridges? 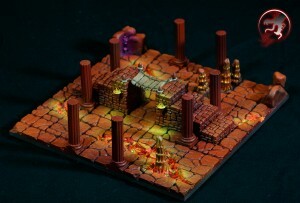 Having 3D boards definitely raises the players excitement to play and the immersion of the games. You have to do less imagining when the board is built up around your little heroes and things seem more threatening. I have been playing that anything with flight can “jump” up the bridge or higher levels just with normal movement. If you don’t happen to have flight you are stuck using the stairs 🙂 The bridge has the same amount of “squares” as that the occupies the floor underneath it. So I think 2×2. It just takes a little bit of extrapolation. It definitely is not as clean as having all the squares printed on the map like the printed tiles. 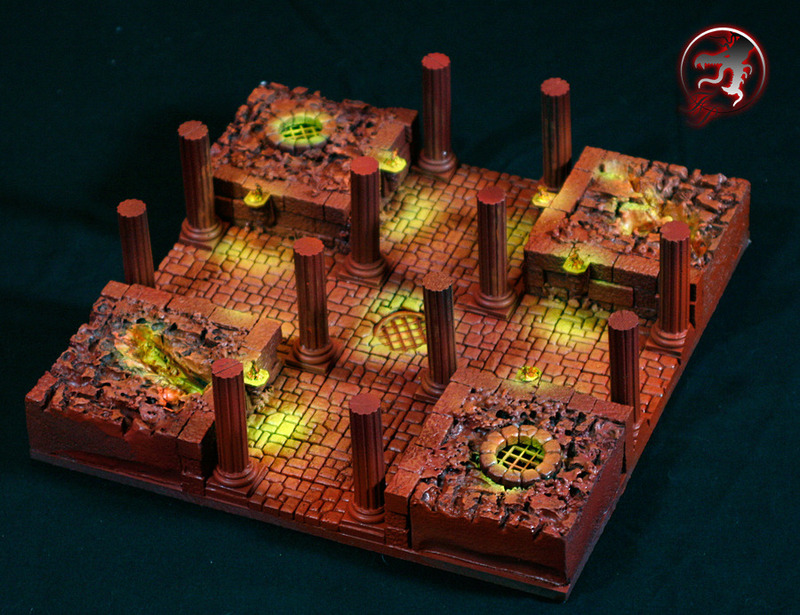 But after playing on it once or twice it is pretty easy to tell where the squares are though on the 3d board. Do you prefer to play as the Consul or Heroes when playing? Which hero is your favorite? Pretty much all I play right now is Consul. I am playing with enough new people most of the time that to keep the game going quickly I have to run it. Though hopefully soon I can see what it is like on the other side of the board. So far the top on my “kill on sight” list is the barbarian and the archer. Either one can kill hordes of my little Consul beasties very quickly. Do you have any rituals while modeling/painting (such as listening to specific music)? Typically I always have a podcast of some type going, or an audio book. I don’t have a lot of time for reading unfortunately, but with audio books I can actually get through my reading and painting at the same time. I have tried watching TV at the same time but find it too distracting looking up and down all the time. What are some of your influences or where do you draw your inspiration from? Are there any books, movies, art, or other sources that have had an impact on your work? I get a lot of inspiration from other miniature painters on the Web. There’s a lot of great talent out there! I have folders of hundreds of pictures of miniatures that I have saved over the years that I will use for inspiration for new ideas and techniques. I think what I am most proud of would be my 40k Tyranid and Hordes Trollblood armies. 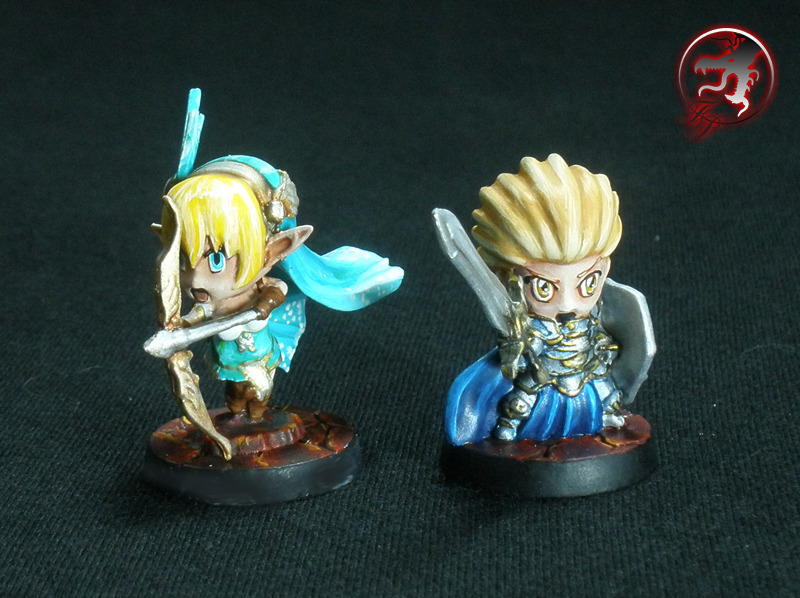 They are all pretty much painted to an above average quality and, more importantly, are finished! Well, at least until the new stuff comes out. Being a player and collector I end up with one of everything at least, so keeping up with that can be difficult. This would be another long list! But in general most of the people that typically show up in the Top on CMON. They have so many good ideas and techniques that it is hard not to look at your own stuff and think it is not very good. But it gives me something to aspire to. Now if I could just clean my painting backlog and dedicate 60 hours to a mini I’d be set! I think I may be a little atypical. I enjoy all aspects of it because they are all each a little different. Building terrain is fun because I am dealing with larger shapes and structures and can use more “classic” building materials and larger tools. I supply most of the terrain for our groups and have a lot of fun coming up with new stuff for us to play on. Miniatures I enjoy for the aspect of creating finer detail and more delicate objects along with using different materials and techniques than you would generally in terrain. 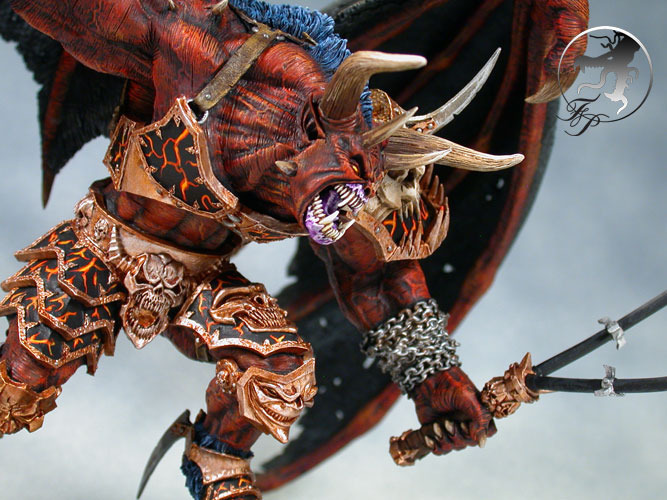 Are there any painting/modeling techniques that have given you trouble? Do you have any tips for someone else who might be struggling with it? Free hand gives me the most trouble. I just don’t get enough practice on it. It is one of those things that just takes time to get good at unfortunately. Some basic tips would be: Thin down your paint and use multiple layers. If you have access to an airbrush it will make your life so much easier for applying base coats to tanks and troops that are generally all one color. Also, don’t get frustrated when it does not turn out right the first time. You can always strip it and start over. Just like with any art it takes practice. There are tons of places out there on the net that have advice on how to model and paint. Shading and free hand. I get caught up on mass production stuff so I don’t get as much practice on the kind of stuff where you use 10-15 levels of fine glazing/shading on a model. I would like to have more time for that kind of practice and painting. What projects are you working on currently? Do you have a dream project? Hmm, currently I have Knight Lords army, two Blood Angel armies, Imperial Guard army, Tyranid army, and a bunch of one-off pieces. For myself I have a few new Trollblood pieces, a bunch of my Menoth army, and a few competition pieces that I hope to complete for Lock and Load later this year. My current dream project involves a very large dragon (about 18″ if you stretched him out), a knight, and a damsel chained to a block with a waterfall and river, and maybe some snow. Right now most of it is just sitting in a box waiting to be worked on. I think it has been there for like 10 years so far…. What tips, tricks, or advice can you share? Are there any special brands or materials that you use that other people might not know about? The biggest ones would be practice, patience, and the internet. Practice will let you improve on whatever you are working on. Patience will give you the time to improve. There are no shortcuts, at least not until they get that whole mind-jack instant-upload thing working. And the internet has a vast resource of knowledge on how to do pretty much everything. This is a good place to start, http://www.coolminiornot.com/articles, though there are lots of places out there with info and advice. Mountain biking, motorcycling, general outdoors kind of stuff, and long walks on the beach… oh, this is not that kind of interview? My wife and I have gone house rabbits, and we’ll never go back. For anyone that is interested they can follow me at www.figurepainters.com. I will keep the site updated as I make more SDE boards. This entry was posted	on Friday, January 13th, 2012 at 5:09 pm	and is filed under Interviews. You can follow any responses to this entry through the RSS 2.0 feed. You can leave a response, or trackback from your own site. I just thought I would stop by and let everyone know that I posted up a Kickstarter for these Super 3D Dungeon Boards. If anyone has questions feel free to ask. Here are final painted boards for anyone that is interested.